It just came out this way. Tree, water, clouds, full of life, ready to burst…. 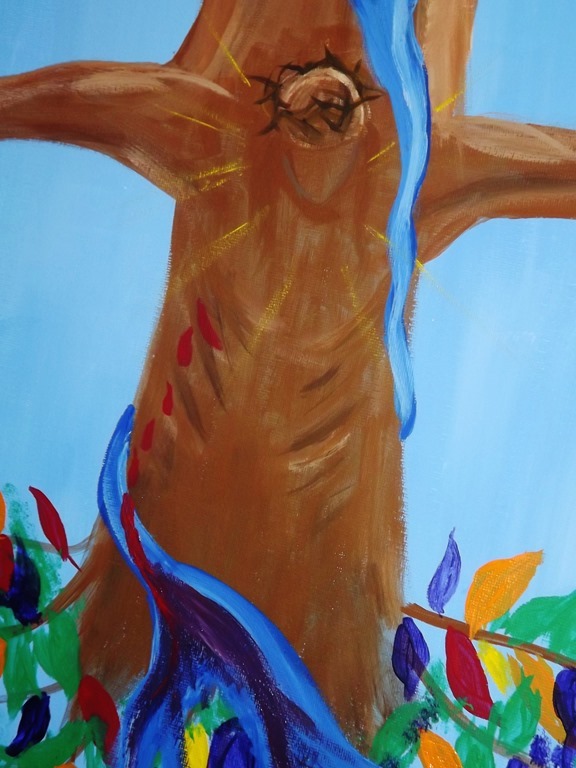 My friend Amanda came over today and we spent the afternoon panting and worshipping our RISEN SAVIOR! 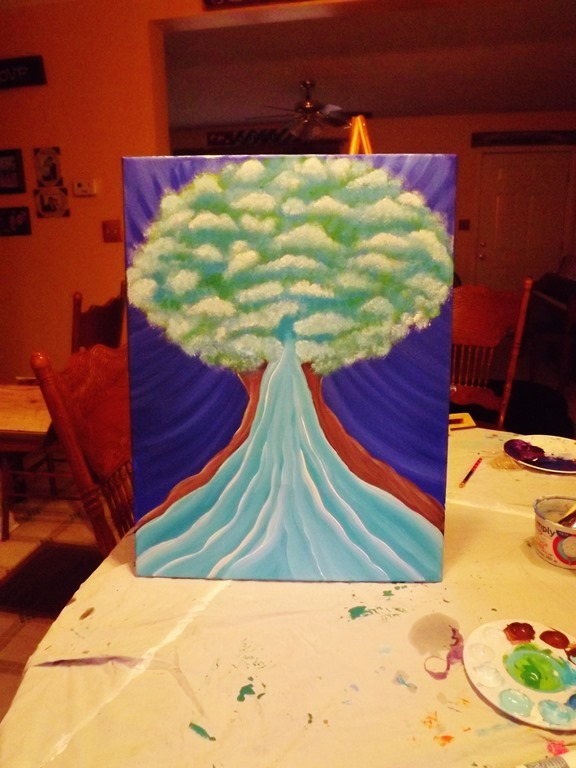 This was Amanda’s first painting! She kept seeing this picture in her mind so I told her to paint it. So she did! It is awesome to have a friend who see’s scripture like you do- visually. I thank God for sending Amanda into my life. If you want to know more about her painting- friend her on FB and I’ll bet she’ll tell ya! 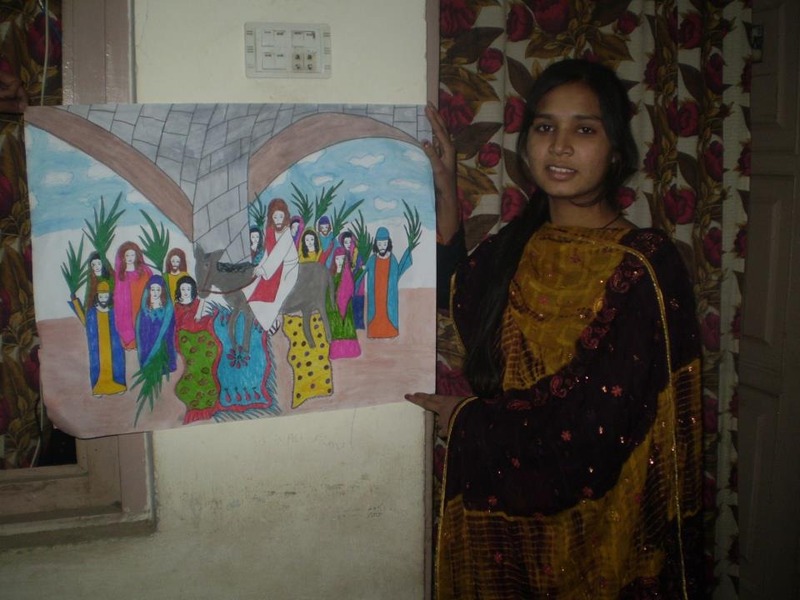 These are two paintings that I did ( along with a friend….) 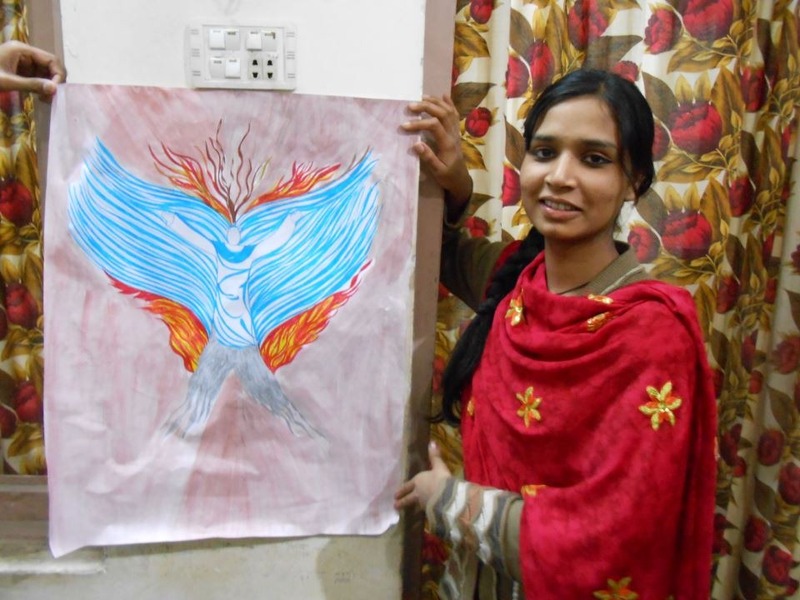 and they have found their “home” at the Prayer Center in Lebanon, KY. .
2 weeks ago I was told to be a “Firestarter” and that’s what these paintings represent. During MSSM5 we heard stories about being a catalyst for God. A catalyst is someone or something that causes a change. The Holy Spirit is the catalyst while we are the willing vessels. I was willing to step out, surrender all ( even more than I knew I had…) and let the Holy Spirit lead and guide. I am very, very excited at what is now happening at the Prayer Center, and many other places, through that step of faith. Each step we take is one step nearer to our Father and it is like taking a Pilgrimage. 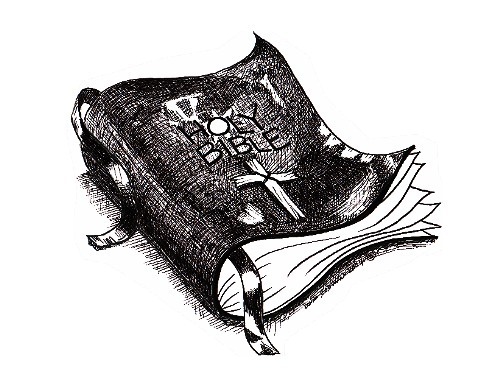 The bible is full of stories of people who were catalyst’s for God. It is to be talked about, shared, written, danced, preached, sung and painted. We are to be bold in the steps we take and not be afraid to share what God is doing- because it is GOD who is doing it- not us. I am so excited about this and wish I lived closer to the Prayer Center to watch this unfold. I know that some awesome God stuff is going to come out of there because it already has. I love watching others walk into God’s destiny for their lives and this is someone’s destiny- to paint their God story in full blown color. I can’t wait! I thank God for Kathy and Don- who run and worship and paint and pray and praise God at the Prayer Center. They have been a huge blessing to me and for me and I am thankful to God that our paths have crossed on this journey into the Father’s Heart. There will be worship Friday night – March 1 – at The Prayer Center beginning at 7! 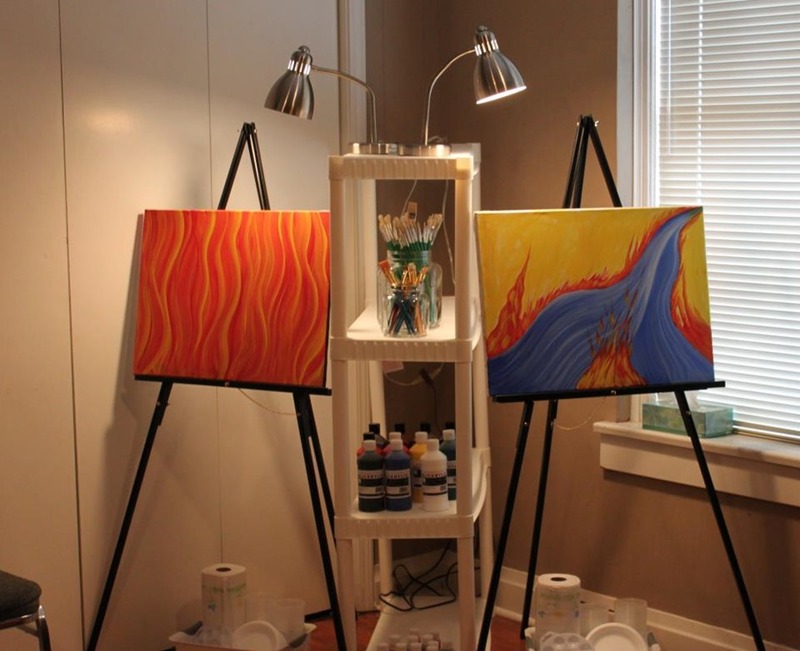 And we’ve added something new – 2 prophetic painting stations! Now let me explain exactly what prophetic painting is. 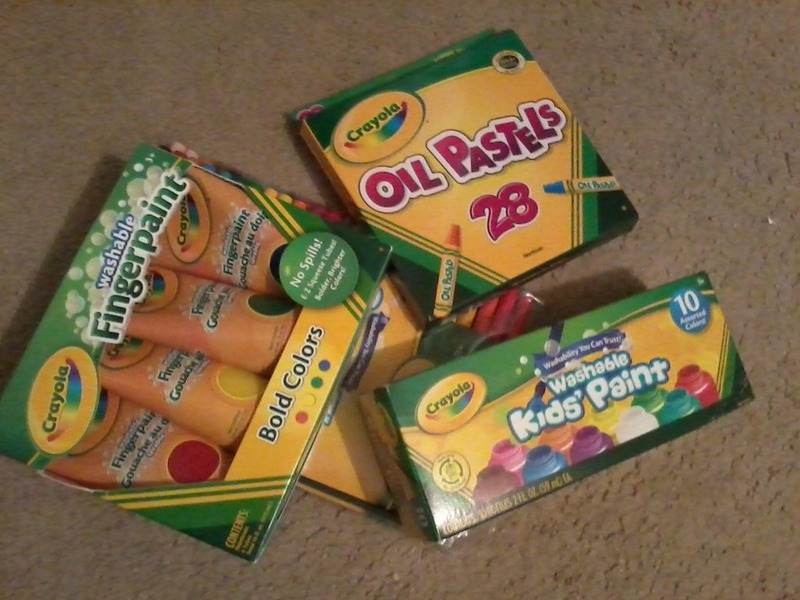 . .
We have everything you need to try your hand at doing a prophetic painting. 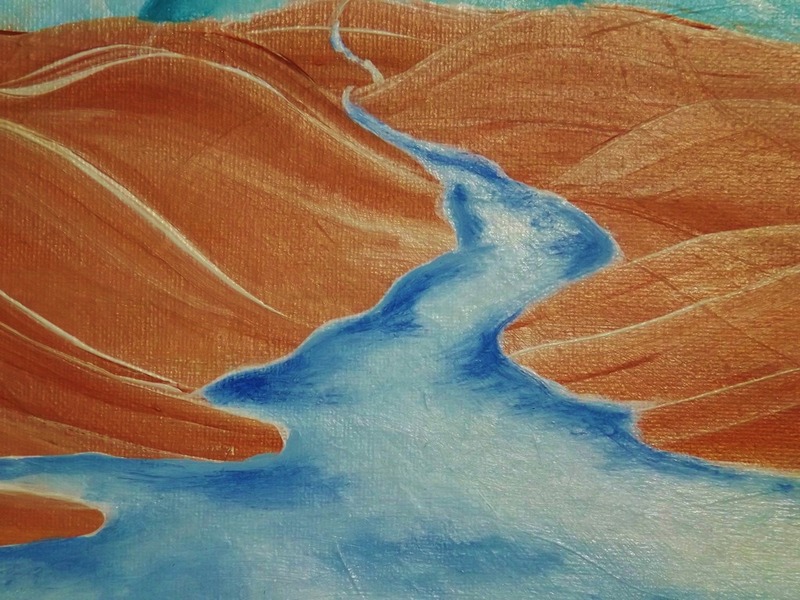 Canvas painting boards are available for purchase with prices ranging from $2 to $6 each – everything else is provided. 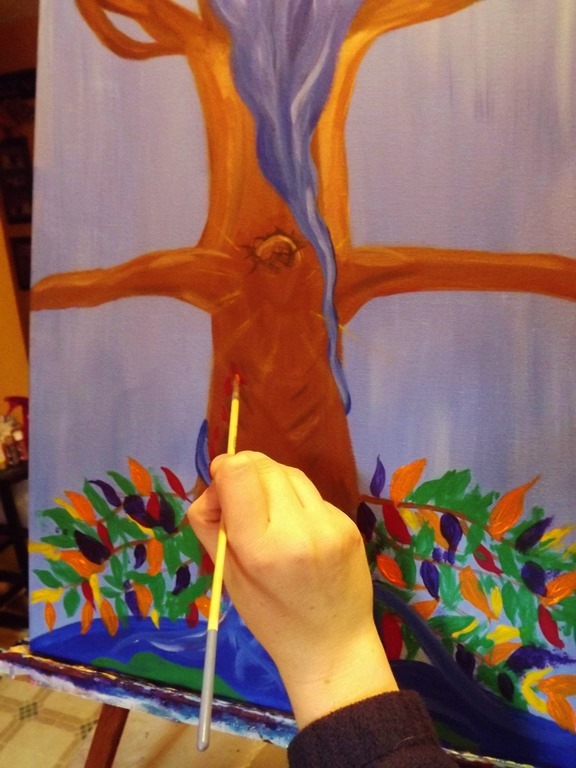 You can paint during worship, or come anytime we’re open. 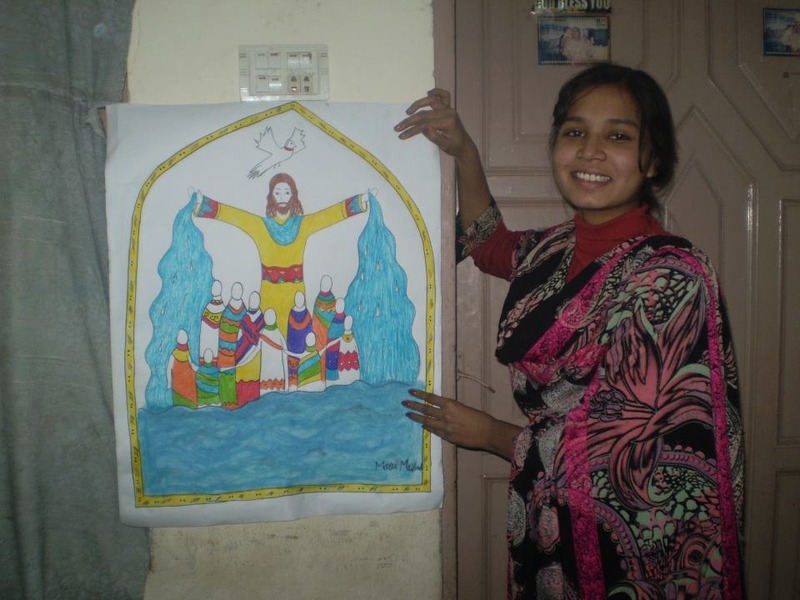 You can take your painting with home you, or if you wish to leave we will be hanging them in The Prayer Center lobby. This is from me- please join me in prayer this Friday night at 7 pm- as the Holy Spirit guides the worship through music and art at the Prayer Center. I can’t wait to see what God is going to do! He is getting an army of artists ready to show the world WHO HE IS IN LIVING COLOR! I am thankful for all He has done for me and how He has always encouraged me to keep going through people like you-who read my blog. This is never about me-but always about the Holy Spirit who lives in ME. He is real, He is alive and He wants a relationship with EVERYONE. 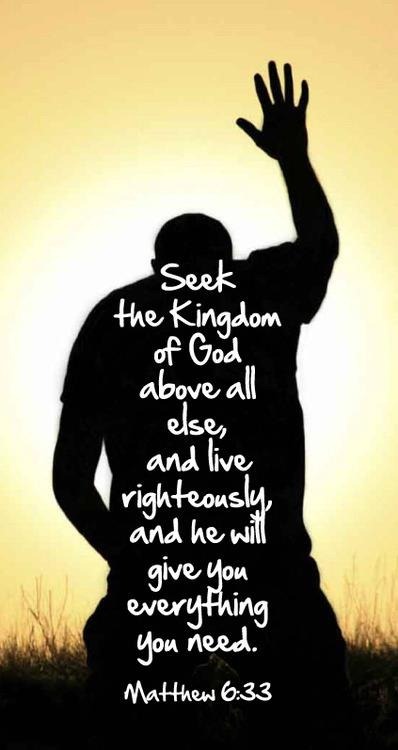 All you have to do is ask, have a willing heart and receive all that God wants you to have. Then stand back and be amazed! Stir up the deep waters Lord….may we all be drowned by what awaits us there…. All glory to YOU, LORD! These colors have been building in me for awhile. I have been “seeing” an outpouring of Living Water all around me-in my mind, in others, in the church, community, on FB, my family, strangers, and on and on. I see it everyplace I go-and to me that is like seeing God everywhere I go. 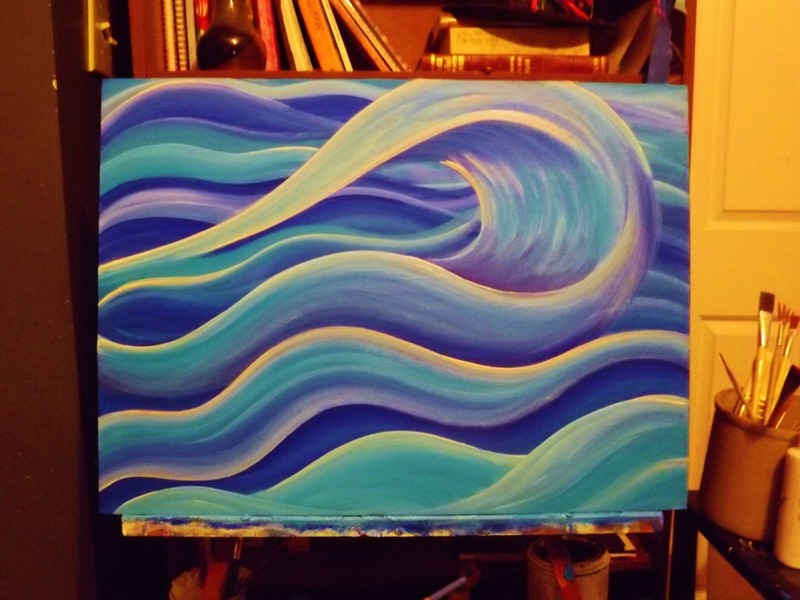 So, how do you see God in a wave? Revelation 22 talks about water too…. 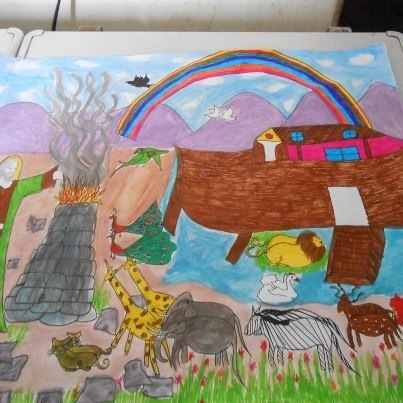 Ezekiel 47 talks about the river of healing…. splash around and rejoice in the One who lives in YOU! 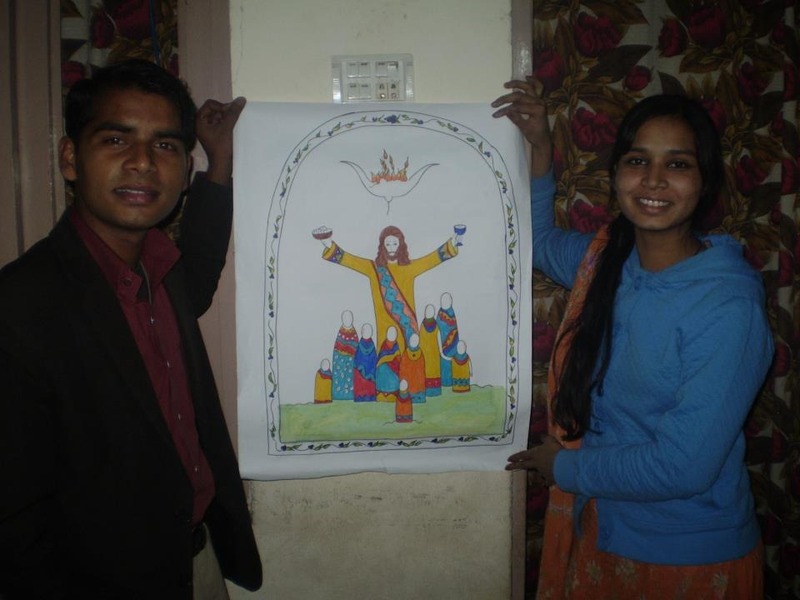 to teach kids how to see Jesus using art. I needed rest. We all do. I also needed that drink of refreshing water that you can only get from the Lord. While laying around being miserable, and unable to talk, I spent a lot of time in the scriptures and in prayer-seeking God’s face for answers to questions that I have been asking for years. Do they ever stop resounding in your ears? What, when, where, how and why? I’m already doing it, right now, right here, through the gifts God has given me and I do it because He loved me first. I hear the Holy Spirit say to me: DONNA!!!!! Stop trying to figure it out. You keep going around the same mountain! TRUST! Those are the only answers I need for today. Tomorrow never comes and the name of the road I travel is “trust.” I must walk the talk I talk , and do the things I say, and do them all with love, honor, and respect for our amazing God. No wavering like the disciples in the wind, , no looking back like Lot’s wife, and no trying to peer into the future through rose colored glasses. Take one step of faith at a time like Abraham and make that pilgrimage INTO God’s heart. Step, step, step. He has given you the promise of His heart- His promised land is in heaven. Just focus on loving people there one at a time. Remember the covenant He made with YOU! One of LOVE and HONOR and TOTAL COMMITMENT. Just BE. Here and NOW. This is prep time. When you bake a cake you have to have the proper ingredients, mixed up, poured out and baked together to form a delicious dessert. Right now I believe God is mixing up and pouring out and He will let us know when it is ‘bake’ time. Until then we do what we do-we BE the ingredient He has asked us to BE. Each one important and needed to pull off an amazing finished product! While in prayer I began seeing an image of wings and water. So I picked up my brush and this is what came out. 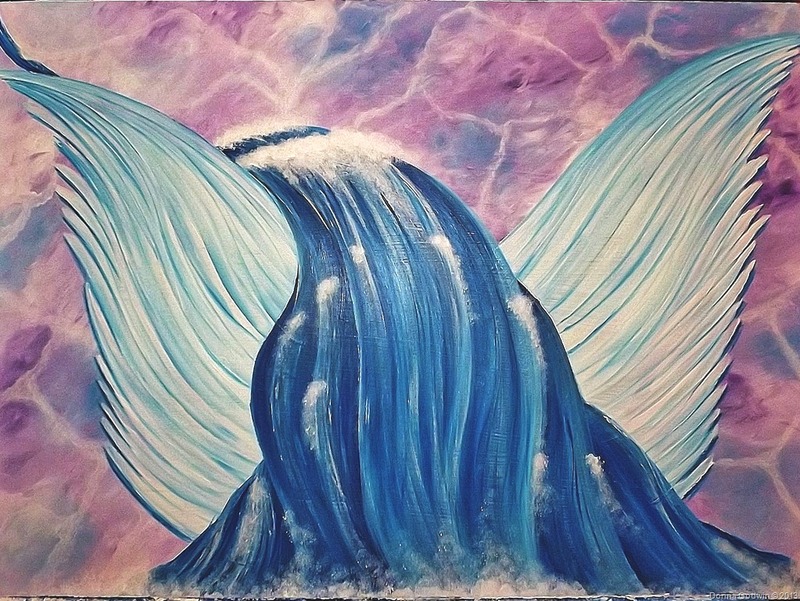 Angels were ministering to me through the painting-they were showing me where the Living Water was coming from…from within me through my belief in WHO lives in me. Anyone who believes in me may come and drink! For the Scriptures declare, ‘Rivers of living water will flow from his heart. As I painted I prayed. The more I prayed the deeper the water got, the flow expanded and the wings of the angel were overcome with the rushing waters of Life that live within me. Whoosh! This painting wasn’t just for me- but for a friend also. The Angel was bringing the refreshing waters of life to minister to the people of the Lord. I thank God for His refreshing drink. My Destiny–to help others heal through use of the arts. as you watch…please pray for healing for the nations to come through the use of the creative gifts that God has given each one of us. 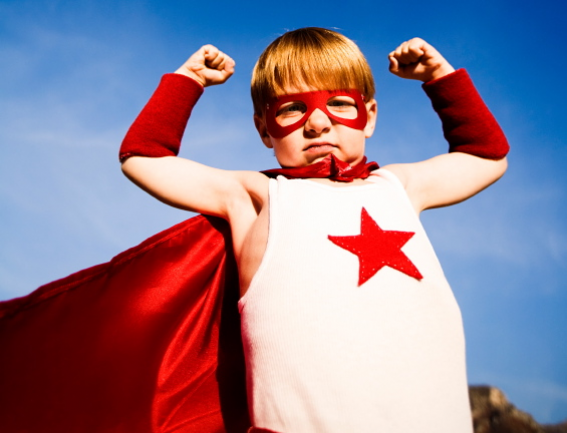 We all have them- the world has just told us that we don’t or that we can’t or that we aren’t good enough. Well, I rebuke those words and I say that with GOD ALL THINGS ARE POSSIBLE and that we DO, WE CAN and WE WILL. We must stop listening to the words of doubt and discouragement and fear. They do not come from God. God is telling us to RISE UP AS A MIGHTY ARMY OF CREATIVE PEOPLE TO CHANGE THE WORLD THROUGH ONE PAINTING, ONE SONG, ONE DRAMA, ONE CARD. WE HAVE THE POWER TO TAKE BACK THE WORLD FOR GOD. I WILL SPEND MY LIFE PROCLAIMING THIS MESSAGE AND CREATING SOLELY FOR HIS GLORY. He also gave apostles, prophets, missionaries, as well as pastors and teachers as gifts to his church. 12 Their purpose is to prepare God’s people to serve and to build up the body of Christ. 13 This is to continue until all of us are united in our faith and in our knowledge about God’s Son, until we become mature, until we measure up to Christ, who is the standard. This is Maria. She lives in Pakistan. We met on FB. 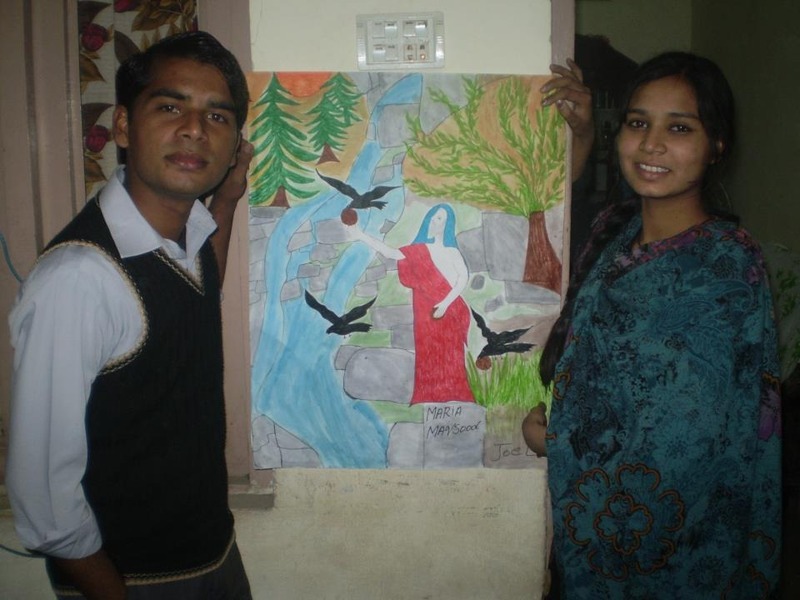 I saw some of her artwork and then sent her some of mine and a friendship was born through our love for God and creativity. These first two drawings were done after two drawings that I had done. 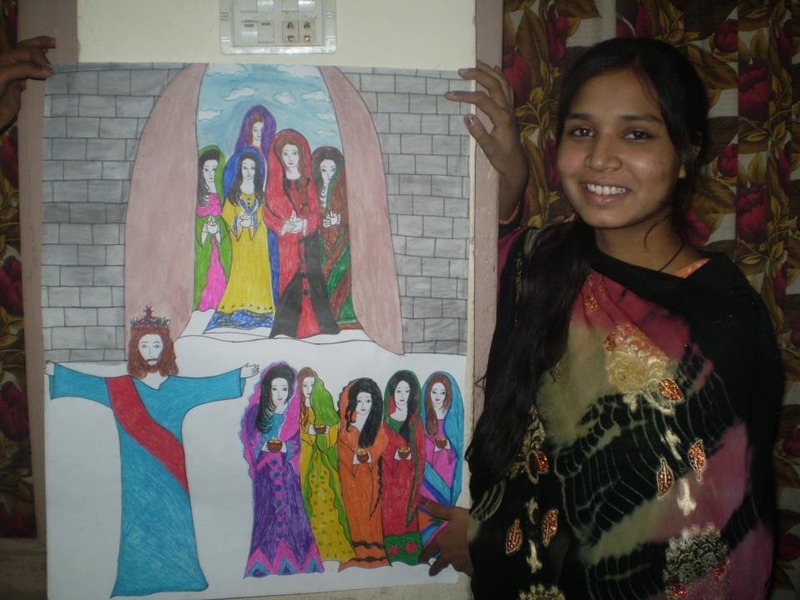 Then I began to encourage Maria to draw from her own vision of what she saw when she read scriptures. Sometimes I send her scriptures to read and sometimes she does it on her own. Jesus on the rock . 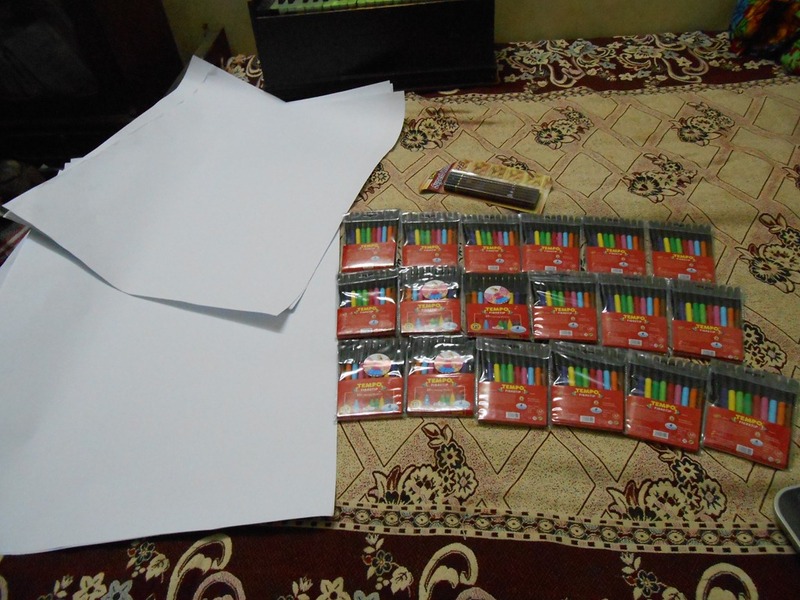 This was done from the angel that I painted during MSSM5. I LOVE the colors she uses! God is a GOD of beauty and extravagance and that is what I see when I look at her work. Royalty. It’s real, it’s bold and it’s alive with the life and love of our Lord Jesus Christ! Amen! I give GOD all the GLORY for what HE is doing here. 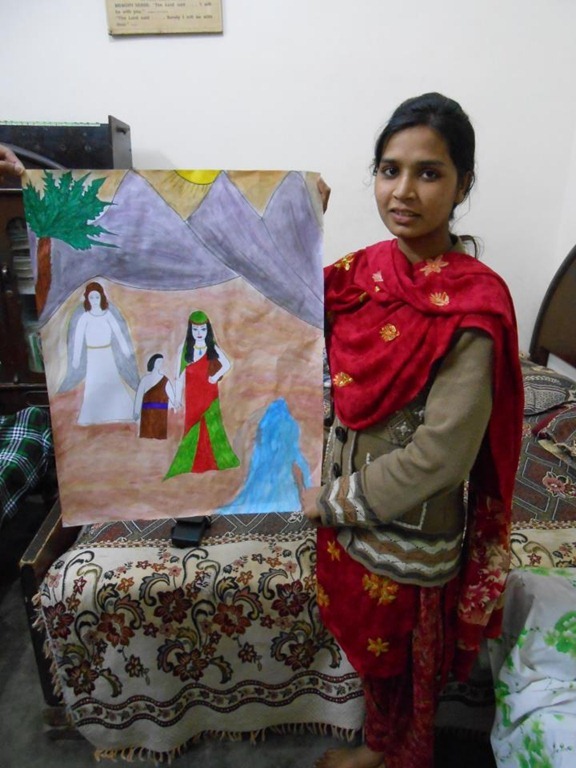 For me to be able to encourage this young girl from my studio to her home in Pakistan just blows my mind. But God is a mind blower isn’t He? I can’t wait to see what is next….I think Maria needs to compile these into a children’s book-don’t you? Send up some prayers for her, my friends, and let’s see what God does! This and this only has been my appointed work: getting this news to those who have never heard of God, and explaining how it works by simple faith and plain truth. 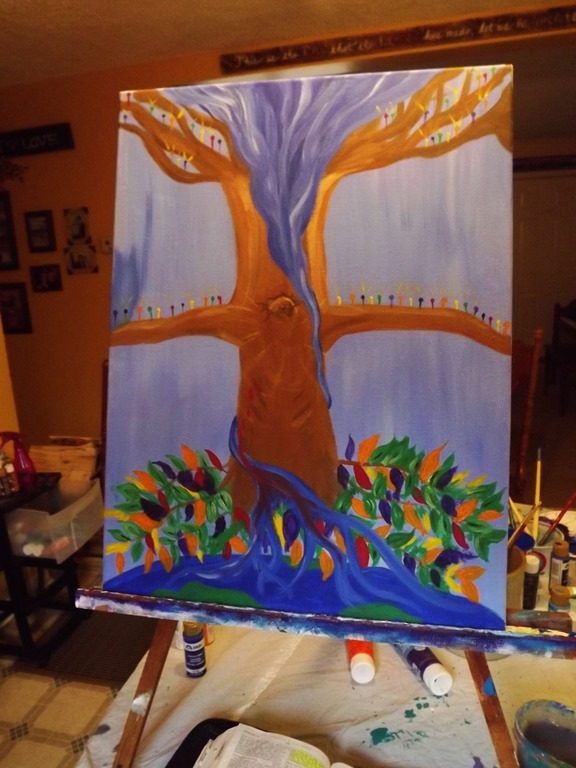 From my palette to yours….be a paintbrush for God….. I have been working on a painting for several days. Last week I went to the Aldersgate Renewal Ministry Methodist School of Supernatural Ministry. While there I discovered who the GOD in me IS and who He wants me to BE. He asked me to surrender all at His feet and I completely and totally emptied myself out only to be filled again with the fresh, clear, refreshing Living Water that only He can provide. I was like Hagar at the stream… only I was running TOWARD GOD and not away. Hagar was Sarai’s slave. 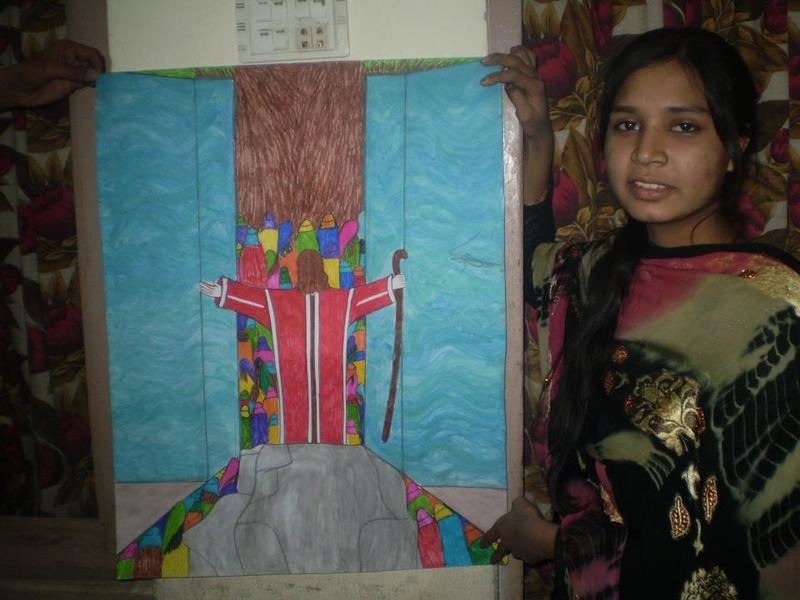 Sarai was unable to conceive children so she had this wild idea that she could do it through Hagar. So, she gave Hagar to Abram and they conceived a child together. So when Sarai found out she got mad and mistreated Hagar so badly that Hagar ran away. 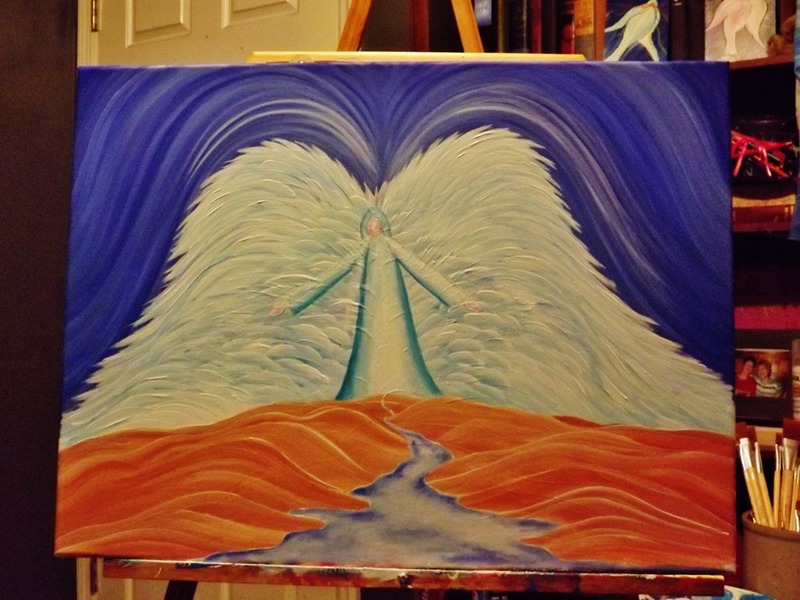 In Genesis 16 we the Angel of the Lord talking to Hagar near a stream in the desert. She was running away. How many times do we run from the things that fear us? because the Lord has heard your cry of distress. 12 He will be as free and wild as an untamed donkey. He will fight with everyone, and everyone will fight with him. Hagar went to the desert to cry out to God in her distress and even though what she did was wrong- God heard and answered her cries. He sees it all no matter where we try to run and hide- He is always there. I find it interesting that Hagar went to the stream and it was at the stream that she found her life. I don’t think she expected that to happen- do you? I see this story as a woman who was parched and needed a drink, a hope, and a plan. Many of us are this woman. Where are we running? We might think we are running away, but really our distress sends us reeling into the arms of our Creator. Our distress forces us to seek the Lord with all our heart, mind, soul and strength. In that moment-God hears, He responds and we receive a drink that refills, refreshes and renews us from the inside out. This is what I received. A deep long, refreshing drink from the stream of Life. God took me to my knees in ultimate obedience. 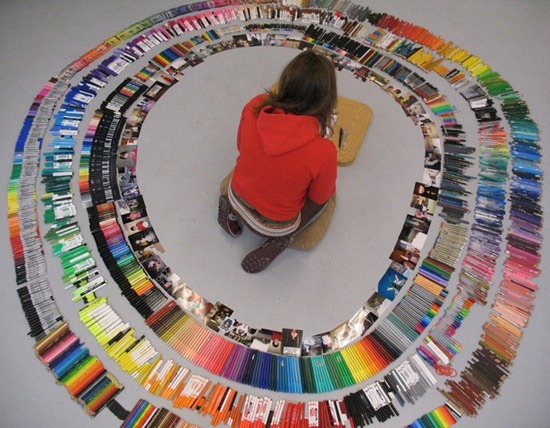 He forced me to drop the very thing that had brought me there-my paintbrush. I think He was saying-how much do you love me Donna? Do you love me enough to put the brush down and walk with me through my covenant heart? Now I am whole and new again. God is an unexpected God and He can show up anyplace ( even through a brush and some paint) He pleases, at anytime, through any circumstance or any person. He uses the least, the lost and the lonely to perform miracles, signs and wonders and when that happens people EXPERIENCE WHO GOD IS in a new way. Then they can’t stop talking about Him! So, God himself shows up and meets Hagar in her distress. He calls her by name and then tells her to go back to Sarai and place yourself under her authority. She was her slave and Sarai owned her. Hagar had gone to the desert to die, but God met her in her neediest time and he brought her up and out of her distress. What did she do? She listened, obeyed and then glorified God. God is with us always. When you seek him with all your heart you will find Him and when you do- He will give you the desires of your heart. Your desires will change into HIS. I met Jesus face to face last year through a renewal event that ARM does. Ever since then it has been the desire of my heart to be involved with ARM and I have prayed about it for the past year. Last week I was honored to be a part of the leadership team at MSSM. Thank you! God does hear us and he changes us from the inside out. He sends angels to watch over us, to minister to our needs and to point us back to our Father. Today I am thankful for the God who watches over me, who leads, guides and makes me fall to my knees in humble obedience and to surrender everything-even my paintbrush. So I thank the Lord for the things He has done inside of me. I know this is just the beginning and I feel His mighty fire raging in my belly. My heart pounds like wild horses galloping across my chest and God is longing for me to let HIM out and BE who He made me to be-to come under complete authority to HIM and only HIM. So, what about you? What is God saying to you in this season of Lent when we give things up. But are we really giving things up….or are we surrendering ourselves to God and putting HIM ON?